Movin’ and Groovin’, Cowfish Style! With so many great exhibits at the New England Aquarium, visitors often zoom through the building trying to see everything. However, once they start to slow down and look at the exhibits more closely, visitors can witness some pretty cool animal behaviors! Located in the Tropical Gallery, the Armored and Venomous Fishes exhibit has some fascinating inhabitants. Striped lionfish cruise around with their long, venomous spines. Rockfish disappear into the background, blending in with the coral in hopes of surprising an unsuspecting prey. And the mover and shaker of the tank? 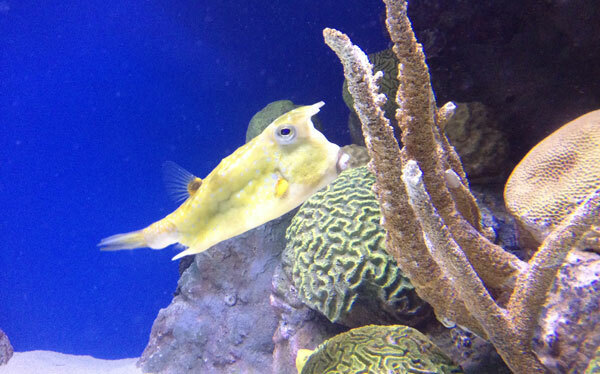 The longhorn cowfish! 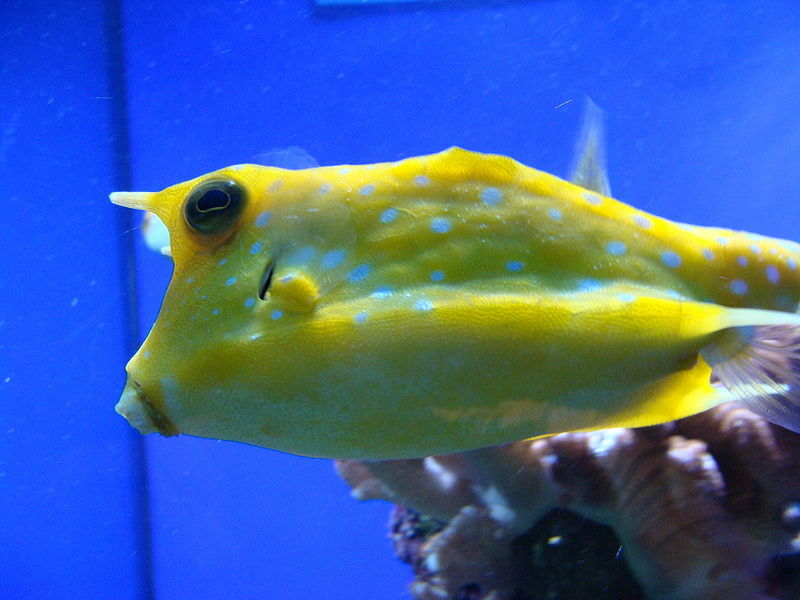 Native to coral reefs and sandy, muddy habitats of the Indo-Pacific, the longhorn cowfish is named for the long horns protruding from their head and below their tail. Those horns may look comical but they make the cowfish difficult to swallow, a pretty efficient way to avoid being eaten by large predators. And though the horns make break off over time, the cowfish will be able to grow them back in a few months. While the cowfish in the Aquarium’s exhibit often moves with this method, one day recently he decided to kick it up a notch! With cameras rolling, the cowfish flicked his tail, moving it in some pretty quick circles! 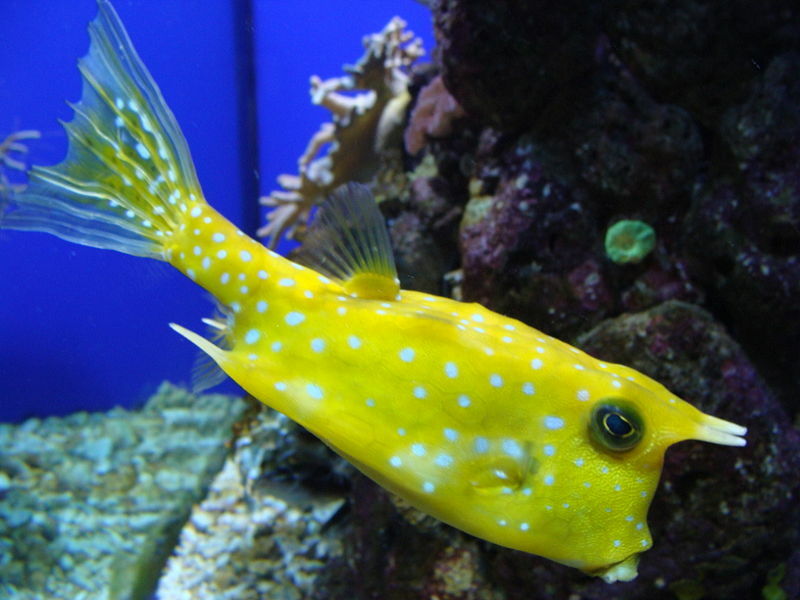 After he settled down, the cowfish went back to his normal swimming pattern. Take a look at the video and see if you can see the different fins helping to propel this fish along. So next time you are in to the Aquarium, slow down for a bit and and stop to watch the animals. You never know when you might see a fish movin’ and groovin’ inside the exhibits! If you liked this video, check out video of the flashy mandarinfish or brace yourself for the surprise in this clip.